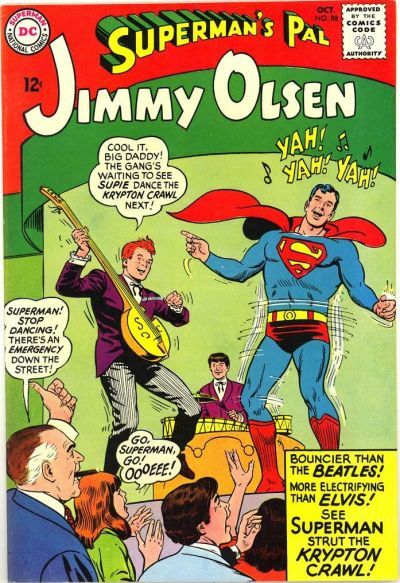 The Superman Fan Podcast: Episode #388 Part V: Superman Family Comic Book Cover Dated October 1965: Superman's Pal Jimmy Olsen #88! Much Silver Age silliness/plot holes in these stories, but still fun. In "The Swinging Superman, spy Bruce Bailey told an unnecessary and easily-discovered lie by telling Jimmy that he'd taken 10 pictures when he'd only taken 5. If he hadn't done that, his scheme might have worked. In "The Riddle of the Olsen Statue", I'm not sure why Superman doesn't seem to consider the idea that many insects can dig through the ground, so the giant insect might well escape and come to the surface world. In "Jimmy Olsen, World's Heavyweight Champ", as you point out, if Jimmy was so heavy, he should have had difficulty moving, and even if he could, he would probably have been exhausted. Also, even though Professor Potter didn't make the serum correctly, he somehow knew when it would wear off? Why does Jimmy keep trusting him? As I said, though, even with all this, I still thing the stories were fun. Not perfect, but fun. With a lot of these silver age stories, it’s important to laugh with, not at these tales, which is something I always try to do.